I’ve had a Rachio smart sprinkler controller since just before the first generation was released, and it’s changed the way that I use water on my lawn and garden. Rachio recently released its third-generation smart sprinkler controller, the Rachio 3 ($229) and with each successive model the product just gets better. Let’s take a look. Compared to the original Rachio that I had been using to control my sprinkler system, the Rachio 3 is literally almost half the size. In the photo below you can see the Rachio 3 on top, the original first-generation Rachio Iro on the bottom. Available in both 8-zone and 16-zone models, the Rachio 3 measures just 9.1” x 5.5” x 1.4” and weighs 1.05 pounds. It’s made to be installed indoors; my sprinkler timer has always been located in the basement of my home. This design is a vast improvement over the original. The wiring blocks simply require a push of the finger to open; the wire is inserted into a hole on the bottom and is then held into place. The original design had small plastic buttons over each wire that needed a small screwdriver or stick to press. With the original Rachio, testing sprinklers was a bit of a task — there was no way to simply push a button on the controller and have it go through a short cycle. You used the Rachio app to do that instead. Now, a rocker button that is oddly similar to the old iPod controls is used to manually run through cycles at the controller. Although I did not test it, Rachio 3 also works with a wireless flow meter that can be installed to give homeowners a completely accurate picture of water usage — including that used for irrigation — as well as detect minute leaks in their water system. The Rachio 3 also includes dual-band 2.4 - 5 GHz Wi-Fi; the original used only 2.4 GHz. This change is useful for providing the best connectivity to your network regardless of which band is selected by the device. One final note: Rachio 3 works with Alexa, Google Now, and IFTTT for even further automation. If there was one thing I wish Rachio would consider, it would be HomeKit compatibility. I'd love to be able to tell Siri "Water the Front Yard" and have the sprinklers run. Installation of Rachio 3 was a piece of cake. 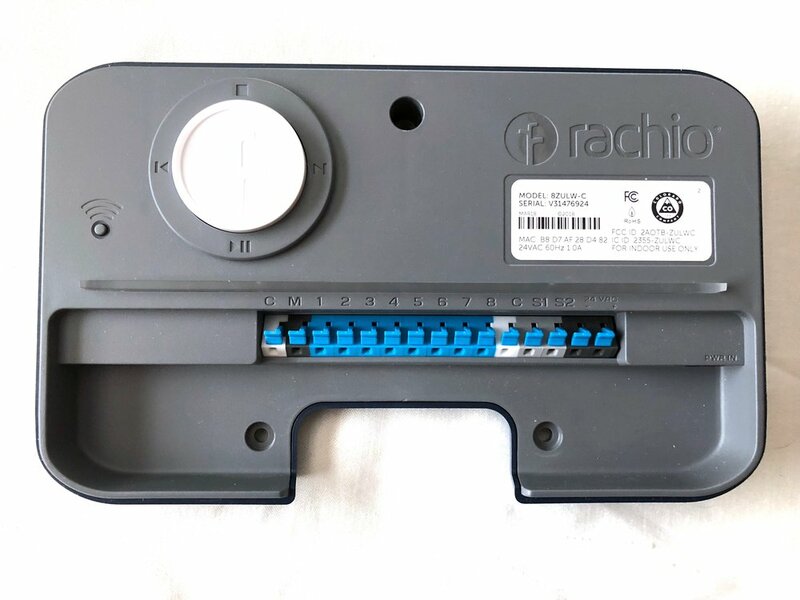 Rachio includes a step by step set of instructions that even includes a page with holes punched in it as a drilling guide for mounting the device. The original Rachio was easy to install; I don’t know how they did it but the Rachio engineers made Rachio 3 even easier to install. To connect Rachio 3 to your wireless network is simple; the app includes a way to add the device to your network and all you need to do is watch a series of LEDs light up on the front of the box indicating connection status. When that’s done, it’s a good idea to go out on your property and start testing the zones. I had to rename several zones to more accurately reflect how things were set up, but when I was done I had all four previous zones set up so that I could test them with a tap. The app has a “Quick Run” button for testing the system or providing a bit more water to a dry area; it can adjusted to provide water in durations from 1 minute to 23 hours and 59 minutes. To set up the sprinkling times, Rachio uses your location pinpointed down to 36 feet. From that location, it can tell whether or not you’ve received natural precipitation lately, what the temperature and humidity has been, and so on. The timer can be set up on a regular schedule or you can do what I’m doing — using a “Flex Schedule” that just determines exactly how much water a lawn needs every few days and then waters…or not. The image gallery below shows the clean and understandable UI of the Rachio iOS app. It's also available for Android. One new feature of the app and controller is what’s called a “Cycle and Soak Smart Cycle” that is designed to more efficiently water landscaping. It works by applying water, then letting it soak in for a while before applying more water…this is done three times. That works better for many types of soil than just dumping a lot of water on the lawn all at once. For example, if Rachio decided that my lawn needed 15 minutes of watering time, it now runs for 5 minutes, soaks for a while, runs another 5 minutes, soaks again, and then runs a final 5 minutes. As with the previous versions of the app, each zone is set up based on the type (warm or cool weather grass, shrubs, trees, etc…), type of soil (clay, loamy clay, sand, silt…), amount of sun that is received each day, type of sprinkler (fixed spray, rotor, rotary nozzle, mister, bubbler, emitter, drip line) and the slope of the land. Rachio uses this to determine how long to run in order to adequately water the landscaping. I know for a fact that the original Rachio cut my water consumption for irrigation by about a third. While I’ve only had the Rachio 3 running for a few weeks, I’ve already noticed that it is running less frequently and for a shorter duration. That should save me even more water and money. Rachio is based in Denver, Colorado (I live just south of Denver) and it’s obvious that the folks who work for this company realize just how precious a commodity fresh water is. They’re working with communities to offer rebates on the Rachio line to encourage more people to water wisely. Rachio 3 is a well-designed, easy-to-install smart sprinkler controller that can pay for itself quickly in dry climates by intelligently determining just how much water your landscaping needs. Coupled with accurate weather data and algorithms that keep you from overwatering, it’s simply the best smart sprinkler controller available. If Rachio can add HomeKit compatibility some day, this device will be even more perfect.